Mountain biking in the Caribbean jungle. John and Pamela devote a lot of time to cycling. Cycling is a source of transportation, recreation and vacation. On this site, youll find stories and pictures from various cycling trips, and tips for various activities, gleaned from experience. Cycling club that promotes cycling through weekly group rides and other cycling events. Non-profit social club that joins bicyclists with different interests: road cycling, family cycling, off road and competitive cycling. Also, helps tourists and offers guided tour packages. Membership form, FAQs, and contacts provided. A resource and community for people who ride bicycles to get somewhere, and to travel gently over the earth. Articles, links and image galleries provide tools for sustainable cycling. Cycling Mob is an online community dedicated to cycling. Covers training, bike gear, tips, photos, bike advocacy and more. Cycling in Atlanta, GA as seen from a road bike, includes cycling fortune cookie. Offers Europe cycling tours, UK bicycling vacations and international bike tours in Austria, Tuscany, the France Provence, Ireland, Vermont and Napa Valley. Established in 1996, cyclingforum.com is an popular and civil online cycling discussion forum and community for passionate, talented and experienced cyclists around the world. Italian adventure travel featuring cycling and walking tours. Photographs by Nigel Farrow showing a small proportion of his library of triathlon, cycling, leisure and travel images. The ACE Road Cycling Club was formed in 1998 to promote cycling. ARCC helps introduce bicyclist to others with a common interest, regardless of experience or skill level. An amateur mountain bike and road cycling team with information on the states racing schedules, cycling events and news. An Indianapolis-based amateur mountain bike and road cycling team. This site contains information on the states racing schedules, cycling events and news. A cycling club for all the family. All aspects of cycling are catered for including mountain biking, track riding, time trials, road racing, touring and socialising. Events calendar, photos, and ride times provided. This is a collection of non-commercial cycling travelogues. Web links include at least one long (a week or more), self-supported cycling trip in South America, either as a travelogue or with enough pictures to give you an idea about the route. Le Vieux Moulin is a home-based adventure travel center, featuring cycling, walking and hiking tours in the Loire Valley, France. Dozens of articles on bicycle camping (bikepacking) and long-distance bike travel, cycling fitness and health, bicycle traffic safety, bicycling advocacy, cyclist humor, and links. A subordinate offering of Interactive Cycling, this site offers FAQs and How-To files covering several facets of cycling and bicycle maintenance. Organises self-guided, self-paced cycling tours in the southeast of Ireland. A day cycling through Denmark and a week cycling through Germany. Mountain, road, downhill, cross, bmx cycling. Provides technical methods for evaluating and estimating cycling performance and parameters. Pictures and some tips on cycling in Northern Pakistan. Provides general information on cycling trails and parks in Australias capital city. If the business hours of Bike St. Lucia in may vary on holidays like Valentine’s Day, Washington’s Birthday, St. Patrick’s Day, Easter, Easter eve and Mother’s day. We display standard opening hours and price ranges in our profile site. We recommend to check out bikestlucia.com/ for further information. 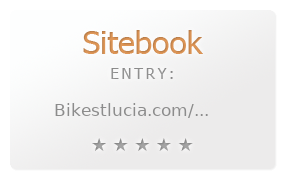 You can also search for Alternatives for bikestlucia.com/ on our Review Site Sitebook.org All trademarks are the property of their respective owners. If we should delete this entry, please send us a short E-Mail.